There was not a dish or a pot in our home that was not used in making that meal. Each contributed to the creation of the overcooked and the underdone. My mother, a truly marvelous woman, was, as I have suggested, an awful cook. And I dare say that was a small part of what made her so marvelous. She knew what really mattered and for her -- unlike the foodies of today -- life wasn't cooking. When she died in an accident years later I discovered that her Fanny Farmer Cookbook (subtitled The Way to A Man's Heart) a wedding gift when she married in 1926, was in pristine condition, not a gravy stain to be found on it, not a earmarked page or a check mark against any recipe. If that was the culinary bible of the time my mother was an agnostic. Her Thanksgiving was a meal to die for but we survived it. Conversation often concerned the relative virtues of the dark as opposed to the light meat, which was sweeter, who wanted the drumstick to gnaw upon, and what mystery spices were in the glutinous raisin and bread stuffing. Not the stuff of a Noel Coward play, but it worked for us. The guests included what was then called a maiden lady, the lonely book-keeper Miss Zaro who looked much like a turkey herself with a reddish beak of a nose and a sack of loose flesh under her non-existent chin where her neck was meant to be. Anyone who lacked a family within wailing distance of our place was welcomed to Thanksgiving at the Yellen's. After dinner, my father would read a story about the Pilgrims and the Indians and how they made their peace together. A noisy, loving, but quarrelsome man, my father was very big on peace, something he cherished but rarely gave to anyone. Like most true pacifists he was often quite angry. As a young boy I always identified with the Indians; still do, who could resist their feathered head-dress and bows and arrows? And who would want to be a sanctimonious God toting Pilgrim in tight black stocking with pursed lips and buckled shoes? 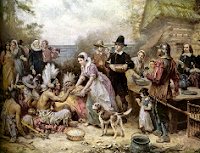 Essentially, we considered my mother's cooking the original Plymouth Rock meal and felt we were as much a part of an historical recreation as any pageant in Colonial Williamsburg. Growing up in the Depression years it was not odd for a boy to have such a mother and believe that this Thanksgiving meal was comprised of delicious food. Cooking was about basic nutrition, not gourmandizing; our cuisinart was the can opener, it was all about sitting down together at the table with salt and pepper, mustard and ketchup to conceal the culinary crime -- I call it innocence -- on our plates, something we did nightly -- and it was about a family grateful for being alive in American in Hitler's world, employed for another year, healthy without the miracle drugs and vaccines of today, loving each other, fighting fiercely and making up and eating all of our evening meals together. Today my side dish is corn -- so you can stop reading if you can't take it off the blog. People don't know how good badly prepared food was when it was offered with so much love. I half suspect that some of this modern attention to gourmet cooking is an effort to make up for the loss of family life in recent years; culinary art replacing plain, hearty meals, families often divided by divorce and the Diaspora of American life where daughters and sons go off to find work where they can and crowded airports are as much a symbol of Thanksgiving as Norman Rockwell's famous dinner. Family has so often been disparaged in films and on TV that dysfunctional is the modifier for family, replacing loving in most discussions. I know that if my mother was alive today (she would be 106) the elegant Thanksgiving recipes in the New York Times would seem another language to her -- and if she understood that language she would respond "What's wrong with them? What a waste of time." She might admire a Martha Stewart as a hard worker, but all those home baked cookies? It would seem a foolish expenditure of a woman's energy when there was an inexpensive bakery nearby with good Hungarian strudel and cookies, and people who needed your help more than your fresh baked pastry. She had clothes to mend, friends to call, charity to give, children to help with their homework, and most of all relatives whose woes required listening and comfort. It was the Depression and we were all natural ecologists. Nobody wasted anything -- even a broken marriage could be mended, reused, refitted, with the lesson of endurance passed on to the next generation. My magnificent electric train set was bought cheap at auction by my father, and after I played with it until the wheels came loose, it would be passed on to my younger cousins. My sister's Baldwin piano was also bought second hand. Only fools spent money needlessly when there was so much good stuff, old stuff, around for reuse. Not that we didn't enjoy new clothes and nice toys -- you can bet we did -- but everything was made to last, bought with the idea that it would be passed on, reused, until the last drop of good or fun was squeezed from it. This was as true of Thanksgiving meals that had a way of being recycled over a week as a sandwich or a snack, each transformation taking it down the food-scale a peg but rarely ending in stomach-ache or food poisoning. Nobody had heard of E. coli (or wanted to). Now I am not a bad food snob, honoring only the overcooked and underdone. I am a great appreciator of the Thanksgiving meal that my daughter-in-law Lise and my son Chris prepare for us in their house -- it puts Julia and Ruth and Martha to shame with its magical transformations of common squash and plain vegetables into food for the gods, and they do it without waving a flag filled with Michelin stars, without braggadocio; two amateur cooks who have had great fun in putting it all together, even with their one and a half year old twin daughters tugging at their aprons. My mother would have loved their cooking, forgiven it for being as tasty as it is because it lacks all snobbery and competitiveness, and bespeaks family love. My son Nick and his four-year-old daughter will be sharing the holiday with us, as well as other family and friends -- and it's a great mix of ages and lifestyles. It will be noisy, giddy, and attended by four cats and Sam, a large chocolate Labrador retriever who will stretch out on the sofa and take up room for four. Most of all it will remind me how blessed I am to have such a family. Sadly my mother was killed in her early Eighties on a New York street while delivering store food to a poor, sick woman; the victim of a careless driver who ran her down on a sidewalk. But this is not what I think about on Thanksgiving: not how she died but how she lived. On the surface times have so changed between my childhood seventy years ago and today, and yet the changes are superficial to me. So much of life is luck, and so much of luck is being born into a good and caring family. Today, just as the resources of this world -- clean air and clean water -- are at risk, it's helpful to look to the past rather than to the futurists for answers. Cliché's can contain some saving truths. "Waste not -- want not" is not the creed of the miser; it is the wisdom of the good mother who wants her children to make a decent life in the world. It means don't give up easy, don't squander your talents, don't look to "things" to replace feelings, and don't find obsolescence in everything you own. Most important, don't worry about how long the turkey has been in the oven if you can spend the time laughing with your children and entertaining lonely friends. So I give thanks for my family, the one who raised me, and the one I have today. Happy Thanksgiving to all; and yes, dark meat, like long ago memories, is so much sweeter.